Ecology: Terricolous; growing sun-exposed; substrate non-calciferous (mainly on exposed bluffs and outcrops). Thallus: Branches densely aggregated. Primary Thallus: Evanescent. 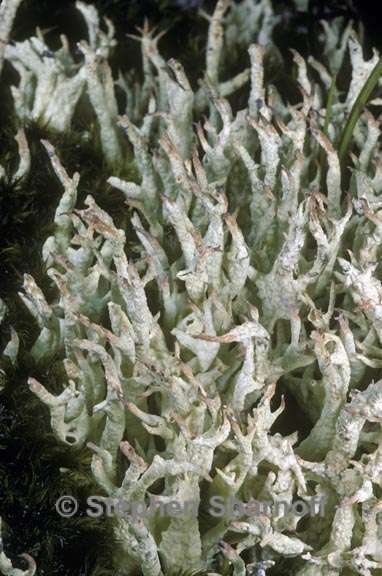 Secondary Thallus: Present, of indeterminate growth; stipe 10-70 mm high, 1.5-7 mm wide, lime green (pale (104)), tainted brown (or greyish red-brown, with tiny colourless crystals forming on older specimens), corticate. Upper Surface: Smooth (to irregular and bumpy). Reproduction Strategy: Only known as sterile, asexually reproducing form. Secondary Metabolites: Hypothamnolic acid and usnic acid (and 3 triterpenes), of the following substance class(es): ß-orcinol depsides and (higher) aliphatic acids (one, unidentified). Spot Tests: Upper surface: K  (negative), C , + deep yellow, or + orange, PD .